Members of the organization Food Not Bombs were in good spirits as they passed out corn on the cob, rice, beans and other vegetarian dishes to the homeless and hungry in an Orlando park. This cheer was interrupted when police officers on bicycles arrived and arrested five of the volunteers. This is not the first time this scene has played out for members of Food Not Bombs. 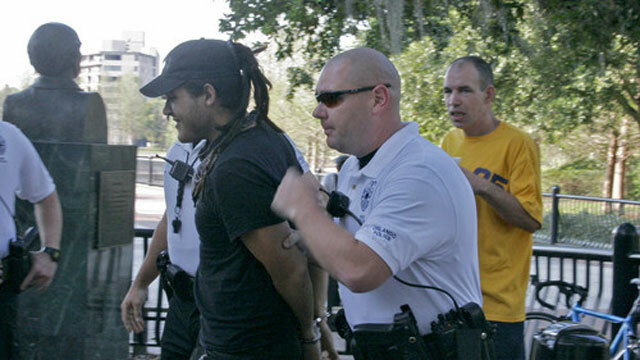 Since June 1, a dozen members of the group have been arrested for violating a new Orlando city ordinance that prohibits sharing food with large groups in downtown parks more than twice a year. The mayor of Orlando even branded them "food terrorists." Food Not Bombs is an international political organization that protests war, poverty and the destruction of the environment, according to their website. The group meets to distribute food twice a week in downtown Orlando's Lake Eola Park. They won a district court case to prevent the enforcement of the new ordinance , but the decision was overturned in the appellate court. A spokesperson for the city of Orlando said that the ordinance had its origins in complaints from residents and business owners about trash left after the food distribution, public urination and concerns about crime. Lake Eola Park is the city's "crown jewel and a signature part of the city right in the middle of Orlando," according to the spokesperson. The city says the ordinance is a permit system that allows them to be aware of what is happening and where so that they can provide necessary services such as clean-up. In regards to Food Not Bombs, the spokesperson says, "We would really like to find a solution and a compromise." The court decision says, "The City of Orlando enacted the ordinance to spread the burden that feedings of large groups have on parks and their surrounding neighborhoods." The document also says that Food Not Bombs could obtain two permits a year for each of the 42 parks in downtown Orlando, for a total of 84 large group feedings a year. The ordinance does not put restrictions on group feedings outside of the downtown area. "The idea that every week we have to move to a different part of the city and that people have to find us just doesn't make any sense," said Keith McHenry, one of the founders of Food Not Bombs and the first to be arrested in Orlando. "It's a really wonderful experience to save food, cook it with your friends, and hand it out," McHenry said. "You can't imagine the government saying this beautiful thing can't happen." Orlando Mayor Buddy Dyer has been quoted calling the group "food terrorists." He told ABC's Orlando affiliate WTFV, "I think they are using food or the feeding of the homeless for different purposes." Cathy Jackson, the executive director of the Homeless Services Network of Central Florida, agrees that motives may be more about self-promotion. "The meal service that's being provided by Food Not Bombs is an unnecessary service," Jackson said. She says there are at least seven shelter operations within less than a mile and a half of Lake Eola Park that provide daily meal services for the hungry. "What the general public needs to understand is that it's a wonderfully motivated act of generosity when a group wants to feed the hungry, but this is only helpful when skilled counselors are participating and connecting with those they are serving to channel them back into a direction of housing and self-sufficiency," Jackson said. Food Not Bombs has no intentions of stopping their distribution of food in Lake Eola Park. They are planning on collecting enough signatures on a petition to challenge the ordinance again. +Should Cities Restrict Food to the Homeless?